Correction: The earliest documented performance of Key’s Banner in pro sports was on opening day at a baseball game in 1862, but the ritual of playing the song at every game developed gradually and was dependent on loudspeaker technology. Yet the claim that it begins with Babe Ruth and the 1918 World Series is false. Key’s anthem was performed for the very first World Series of 1903, and the 1917 Series instead offers a better predictor of the power of patriotism in baseball. 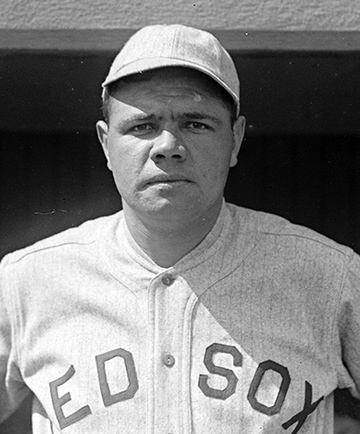 Boston Red Sox pitcher and slugger George Herman “Babe” Ruth, Jr. in 1918. It is a great story: We are in Chicago. Hall of Fame legend Babe Ruth is pitching for Boston’s Red Sox against Chicago’s Cubs in the opening game of the 1918 World Series. He would win the game, yet, both the weather and the country’s mood were bleak. The U.S. has entered World War I, and as a result baseball’s talent pool had been depleted by the military draft. Attendance for the Series was abysmal. Then, during the Seventh Inning Stretch, a band unexpectedly played the patriotic strains of “The Star-Spangled Banner.” The players salute. The crowd rises to its feet. Fervor for nation and the game is renewed. Everyone sings and applauds the band—coming to life with an enthusiasm heretofore absent from the championship series. For games two and three, this same Star-Spangled ritual takes place and with similar effect. The crowds grow and—not to be outdone—Red Sox managers hire a band to play the Banner when the series shifts to Boston, but it’s now as part of the pregame ritual. Other baseball managers take note of the increased ticket sales. A tradition is born. GREAT STORY, but not great history. In fact, the 1918 series was poorly attended, so much so that players briefly went on strike because they would not receive their expected revenue share for the games. Yes, “The Star-Spangled Banner” was performed to great enthusiasm, but the capricious weather had more of an impact on attendance than the music. What the 1918 story has is star power—Babe Ruth and the Red Sox—the makings of another powerful mythconception. Cy Young, the superstar pitcher for whom major league baseball’s pitching award is named. 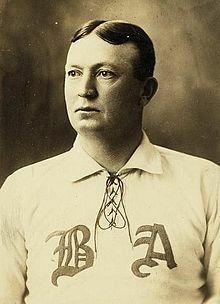 The BA on his uniform stands for his team—the “Boston Americans.” They became the “Red Sox” around 1908. Instead, I’d propose that we remember a different legendary Boston star—Cy Young—who pitched a pivotal October game in 1903 in what is now recognized as the inaugural World Series, beating the Pirates 7 to 3 to take the Series back to Bean Town. O [Say Can You] Listen to the Band? — Graphic from front page of Oct. 11, 1903 Boston Globe newspaper announcing the team’s victory and celebrating the role of the band and its music in their success. 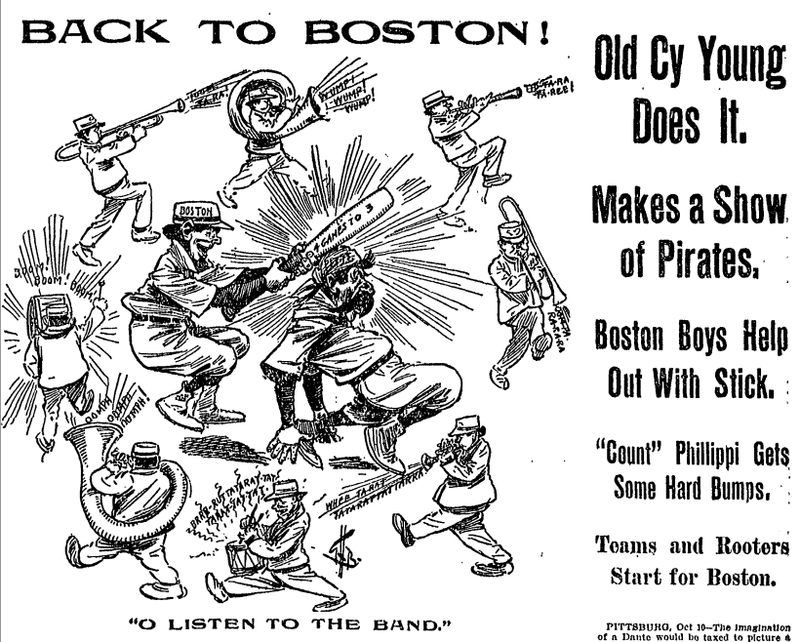 The bands’ musical argument is more comprehensible when we realize that Boston’s team was not yet known as the “Red Sox.” Instead, they were the “Boston Americans” or the “Amerks.” Thus, by playing “America” as the Pirates took the field, Boston’s band was offering more of an insult than being patriotic. Pittsburgh’s musicians then repeated Key’s Banner, a number Boston had already played. Presumably the Pirate band was either trying to play it better or maybe the musicians wanted to proclaim that Pennsylvania was among the original colonies as well and thus had as much right to the title of “Americans” as their opponents. In response, the New Englanders offered a medley pitting the Revolutionary north against the Confederate south. Maybe they meant Boston vs. Pittsburgh, which is admittedly located (very slightly) to the south. Back in Boston three days later, the “Amerks” would defeat the Pirates to win the Series in eight games—5 to 3. The 1917 Uniforms of the Chicago White Sox, emphasizing both their American League membership and their wartime patriotism. So, it’s just a fact: “The Star-Spangled Banner” was present at the very first World Series in 1903. And if we’re searching for a World Series that deepened the relationship of America’s song to America’s pastime, we would need to look to the “Star Spangled Series” of 1917, played at the beginning of U.S. involvement in World War I. “The Star-Spangled Banner” was again sounded by live brass bands, but while the war was said to dampen the nation’s enthusiasm, attendance for this 1917 series was actually very strong (second best in the history of the championship to this point, according to the San Francisco Chronicle of the day). 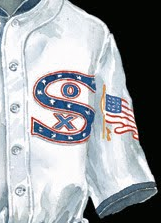 As the “American” League champions in 1917, the Chicago White Sox, literally wore their patriotic pride on their chests and sleeves (see inset). Owner Charles Comisky, a founder of the American league, apparently felt that patriotism was good for business. So, he decorated his team in stars, flags, and spangles, plus he promised to donate part of his team’s earnings to the Red Cross. Things worked out well: the Sox triumphed over New York’s Giants 4 games to 2. What limited the regular use of “The Star-Spangled Banner” at baseball games until the World War II era was not a lack of patriotism but cost. Loudspeakers and outdoor public address systems so common today were not installed until the 1930s. Prior to this time, music at the ballpark meant hiring musicians, either an organist or for special occasions (such as opening day or the World Series)—a professional brass band. P.S. By the way, the 1918 Red Sox did steal the series from the favored Cubs 4 games to 2, but they wouldn’t win another championship for 86 years. This entry was posted in Baseball, Hockey, In Sports, Mark Clague, Sports, The Anthem. Bookmark the permalink.